As part of the European Care (Coordinated accelerator research in Europe) programme, SACM is participating in a project centred on high-intensity pulsed proton injectors (Hippi). Through the research and development necessary for this type of accelerator, ten European institutes are coordinating their efforts to improve the major European installations at Cern in Geneva, the Rutherford Appleton Laboratory in the UK, and the GSI in Darmstadt. The goal is to increase proton and neutrino flux for future physics experiments. 700-MHz superconducting elliptical cavity. This type of cavity, with β equal to 0.5, is particularly well-suited to the energy range 100-200 MeV. One of the major themes of this programme is the development of superconducting accelerator structures – particularly efficient for accelerating intense beams with a high-duty cycle – which operate in the 100-200 MeV range and attain gradients above 7 MV/m with quality factors on the order of 1010. SACM, a major player in this programme, is in charge of building and testing prototypes of superconducting cavities, and of developing and conditioning high-power couplers. It will also install and commission a test station with the horizontal cryostat Cryholab and a radiofrequency power source at 704 MHz with peak output of 1 MW. 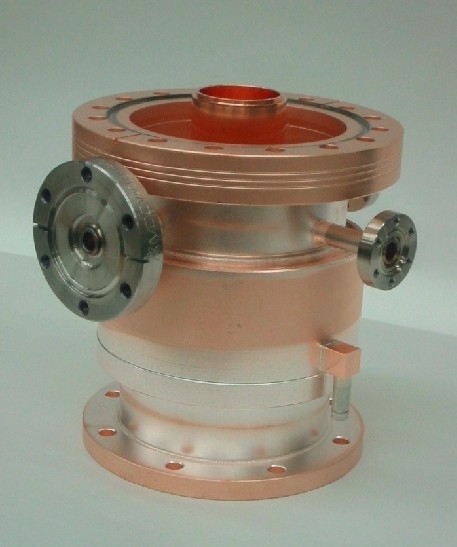 Pulsed power coupler (1 MW) for superconducting proton linacs. The main components of the coupler are, from right to left in the diagram, the transition between the waveguide and the coaxial, the window, and the cooled connection to the cavity. Several types of superconducting cavities exist; the choice depends on the particle to be accelerated and its energy. In the specific case of 100-200 MeV linacs, the proton velocity β is relativistic (comparable to the speed of light) and varies between 0.4 and 0.6. Elliptical cavities where β equals 0.5 are particularly well-suited to this energy range. However, their operation in pulsed mode can be rather complicated due to electromagnetic pressure forces that act on the walls, thereby modifying the frequency of the cavity. The higher the field level, the more pronounced this phenomenon, which can hinder proper beam acceleration. In order to overcome this limitation, SACM has designed and built an elliptical superconducting cavity at 704 MHz with the capacity to attain high accelerating fields (after optimisation of surface fields and acceleration efficiency); a double stiffening-ring system makes it possible to control frequency variation at the same time. Window of the power coupler (1 MW). The alumina window separates the ultra-high vacuum of the cavity from the surrounding air. To accelerate the proton beam (several tens of mA) using high fields (10-20 MV/m), each cavity must be supplied with radiofrequency power on the order of several hundred kilowatts. This is the role of power couplers. 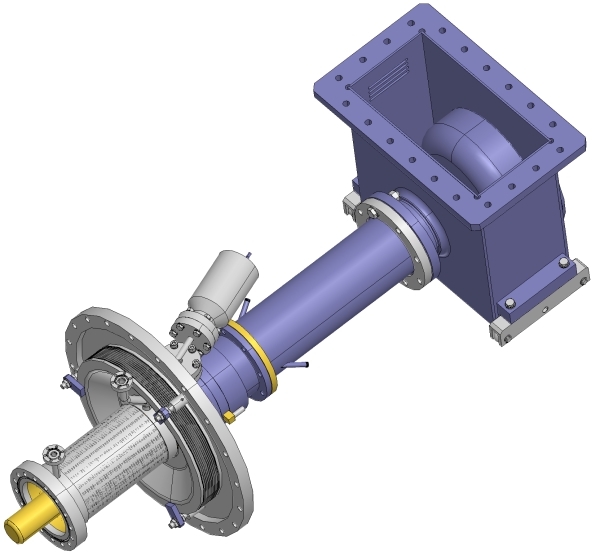 SACM is developing a coupler capable of transmitting up to 1 MW to the cavity in pulsed mode, with an average value of 100 kW. A prototype of the alumina window, which separates the ultra-high vacuum of the cavity from the surrounding air while at the same time allowing for high-frequency matching, has been built. It has undergone testing at low-power levels to verify its high-frequency characteristics. Two complete couplers are currently being built. SACM's high-frequency high-power installation including benches at 704 MHz and 1300 MHz. In order to test all components, SACM will acquire a high-power test bench at 704 MHz supplying more than 1 MW in pulsed mode. The bench includes a 110-kV power supply, a modulator generating 2-ms pulses at 50 Hz, and of course the klystron which generates the radiofrequency power. 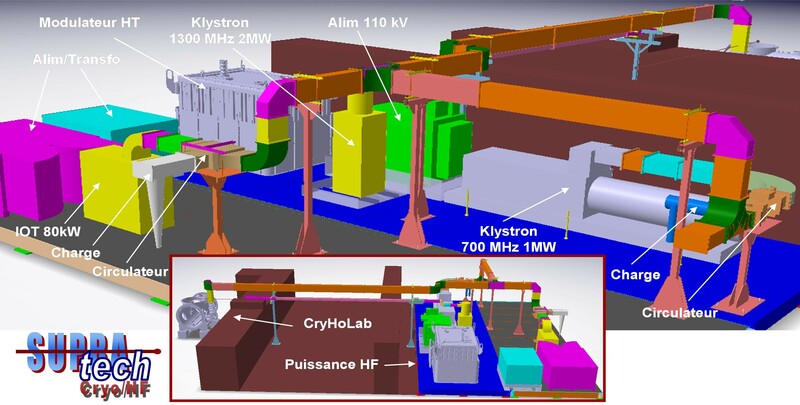 The klystron output can be connected via a network of waveguides to a test bench and to Cryholab, the test cryostat. 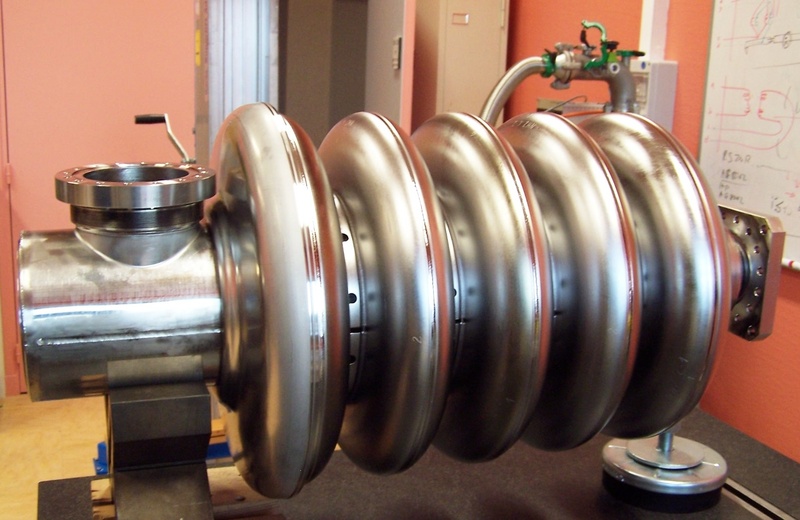 This allows for studies on power couplers, for their conditioning, and for conducting cavity tests in an environment comparable to that of an accelerator.